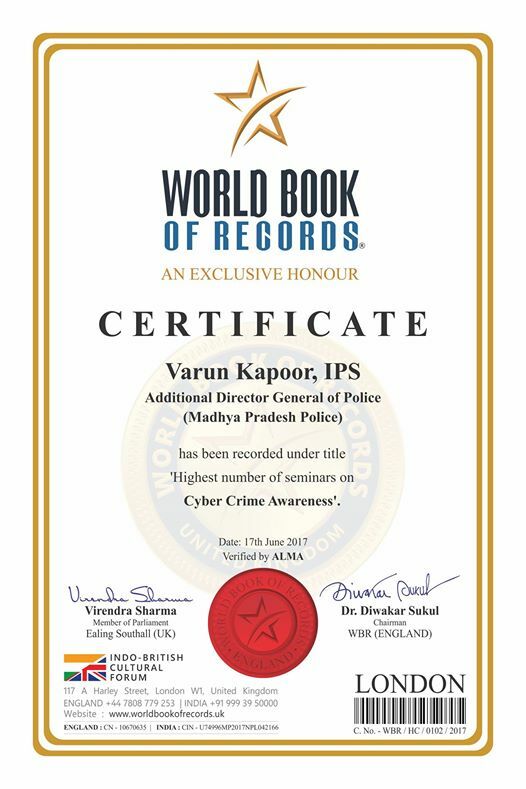 Varun Kapoor an Indian Police Service Officer (IPS), currently posted at Indore, has added another feather to Madhya Pradesh’s (MP) hat by securing a world record for highest number of cyber security awareness workshops conducted so far. The Additional Director General of Police (ADGP) has secured a place in the “World Book of Records, London” for conducting nearly 219 workshops in four years. Not only this, he has been awarded with APJ Abdul Kalam Rashtriye Samman and the list goes on. 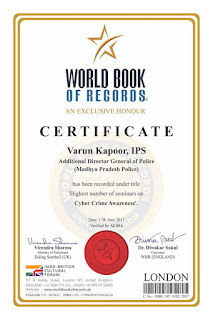 In an informal conversation with newscrust.com Varun Kapoor opens up about his inclination towards conducting cyber workshops and also his achievements. Where is your upbringing from? I was born in Indore on 14th May, 1967. I completed my engineering from National Institute of Technology. My father was an IAS (collector) in Indore when I was born. I joined police services in 1991. I like travelling and wild life photography. I have visited 60 countries as of now. Hungary and London are my favorite. 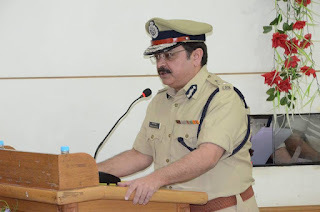 How many years served as an IPS officer? It’s been 26 years now. I started my career from Indore. I was posted all over like I was Additional Superintendent of Police (ASP) in Mahu, ASP in Indore, and commandant of battalion in Ujjain. Other than this, I was Superintendent of Police (SP) in Dhar, Sehore and Ratlam. Then I served as DIG range in Chattarpur, DIG range in Ratlam and DIG range in Ujjain. Then I became IG in PRTS (Police Radio Training School, Indore) where I started with cyber crime awareness workshops. Now I am ADGP in Narcotics and I have additional charge of PRTS as well. I have worked with United Nations Missions at Georgia and Bosnia. When did you start taking up the workshops on cyber crime awareness and how was the response? This was not part of my job. When I was posted in PRTS, I thought why not to do something for my police force so that they can learn new skills and new techniques. It was 2011 when cyber crime was new and it was to be a big challenge in years to come. 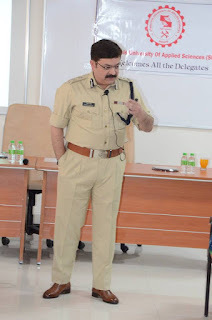 From all over India, police force came for training in cyber course. This was the first stage to empower the police. Now the second part was that people should be aware that how to prevent crime. 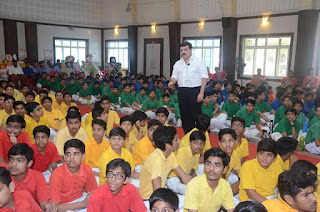 In 2013, I took my first seminar in Indore where we talked to some children about cyber crime security. I visited 21 states and made people aware. We have divided it in four parts: Sandesh Abhiyan (for school students), Sankalp Abhiyan (for college students), Samadhan Abhiyan (for general public and organisations), and Sanyog Abhiyan (for institutions, banks, public sector organisations). It was very well structured and people get good benefit out of this. How World Book of Records, London came in your knowledge? They came to know via social media platforms that till now I have conducted 219 workshops and that’s an achievement. So, they came over and checked the details and the process commenced. They made it a record and awarded me with a certificate. What are the key points that people should keep in mind while using internet? Recently India was hijacked by a ransomeware. What exactly was it and how we can keep our devices safe from it? Ransomeware is a malware (bad program). This ransomeware was “Wanna cry”. Wanna cry was sent through an attachment in an e-mail. When people use to download the attachment, that ransomeware automatically installs in the computer that encrypts all your data. It encrypts into a special kind of a code. Opening that encryption lies with the person who has sent you that malware. Don’t open the attachments if you don’t know the sender/unknown source. Don’t ignore the upgradation of your computer security. India was not very badly affected. India was lucky because they attack more European and American countries. Some part of India like Trilangana, Kerela was reported. Banks and ATM’s were closed due to precautions.